What do you want to know about binding? Above you'll find all the links to previous binding posts. Up next... how to bind curves! 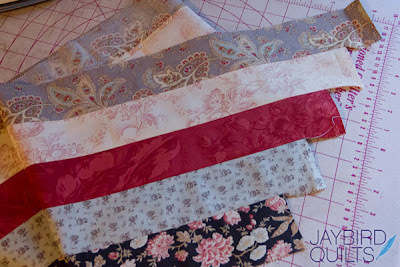 Have you ever needed to make a bias binding but you don't have enough fabric? I needed to make a bias binding but the only thing I had left that matched was a few jelly roll strips. Now if my project didn't have curves I could have just pieced them together, but since I needed a bias binding I had to come up with another solution. X + 1 = # of strips you need. 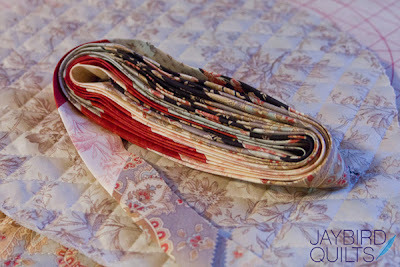 For my project I used 5 leftover jelly roll strips. 2. Sew the strips together with a 1/4" seam and press open. 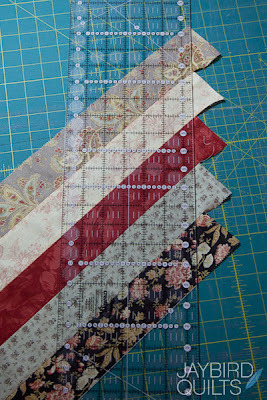 Offset each strip by approximately 2" to avoid waste in cutting. 3. Use the 45° angle on your ruler to trim the ends off of the strip set. If your ruler doesn't have a 45° angle you can use the marks on your cutting mat. 4. 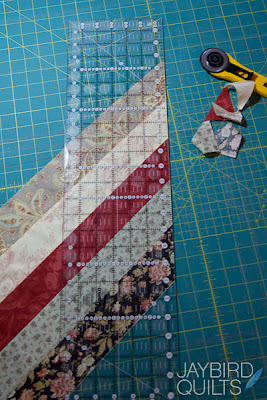 Turn the strip around and begin cutting your binding. I cut my strips at 2.25" wide. 5. Continue cutting along the entire strip. 6. Match the ends and sew them with a 1/4" seam. More details are in post #1. Press the seams open. Repeat to create one long strip. 7. Press the strip in half WST to finish the binding. 9. Roll the binding up until you are ready to use it. Coming up next I'll show you how to apply this binding to inner and outer curves. © 2011-2019 Julie R. Herman. All rights reserved. 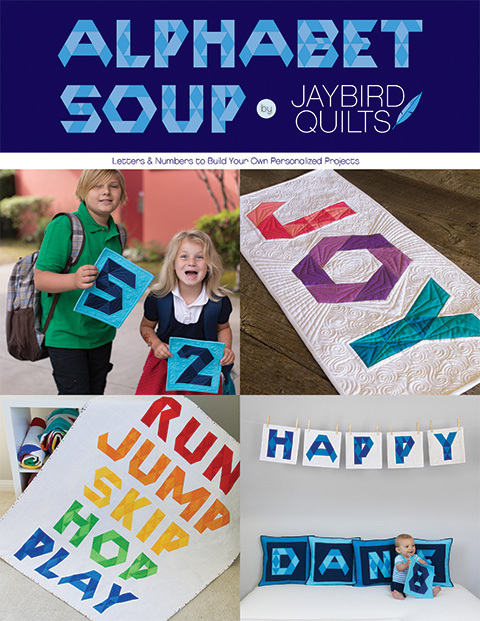 No part of this tutorial may be reproduced without written consent of Jaybird Quilts. Very cool! Thank you for the instructions. Excellent tutorial Julie. Can'wait to see what this goes onto! Thanks! looking forward to the binding for curves! thank you for taking the time for these turorials - they are very helpful! Wow how cool is that!! Very clever, I would have never thought of doing this! I love this idea! Super cool. But...if you press the strip in half RST won't it be INSIDE out?! I think you mean it should be pressed with the right sides facing out? Lovely! Scrappy binding is so fun! 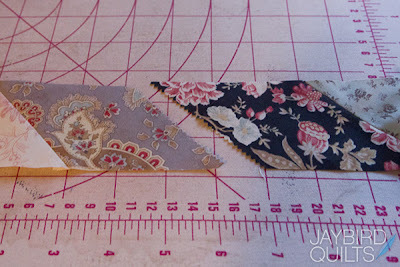 I may just have to try this scrappy-on-the-bias binding for my Carnival quilt! This is GREAT!! Thank you for this information! What a wonderful tutorial and wonderful blog. Thank you for sharing your knowledge and experience with us. I am your newest follower. Please come visit me sometime at my new blog, Ric Rac and Polka Dots. I'm brand new, but have lots of really fun stuff to share with everyone. Hope to see you there! Julie you are amazing. Thank you so much and hope all is well in your world. Thank you!! Great tutorial. Always wondered how to do this. Great tutorial Julie. Thank you. I can just see your little math mind (or big math mind) at work here. Thanks. Completely unrelated to your great bias tute! What does it mean when someone says that fabric "has a good hand?" What a great idea! I will try this on my next project! That is the best idea. 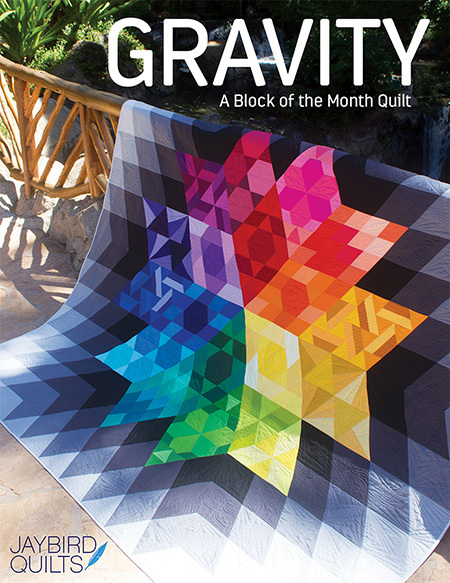 I'm using it on my next quilt. Whats so wonderful is that at the end you can sew the two tails together because it's already biased. You are SUPER. This is awesome. What a great idea. Thank you for showing us. 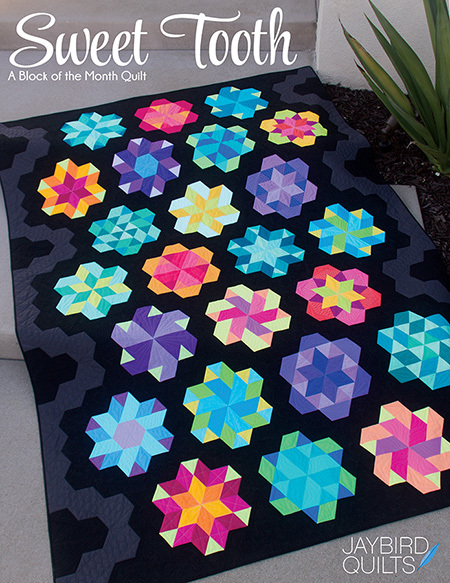 PS: I've popped you on as one of the cool quilting websites to go to on my blog. Just thought you would like to know. Awesome idea! Love your work. Julie, thank you SO MUCH for always sharing your knowledge with us. I appreciate it SO much! 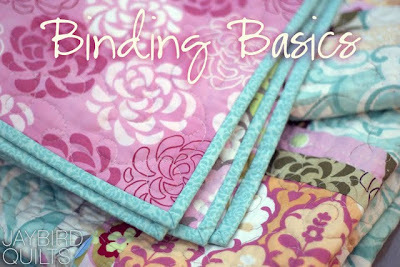 I can't wait to try this binding trick. 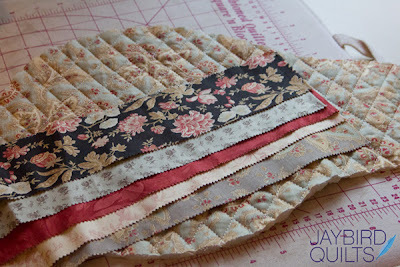 How cool to have binding already made and ready to use using up our scraps. Love it! I'm a happy follower of your blog and would love to have you visit mine as well. I've always got something going on. Please drop by and show your sweet face! I just lovey our blog! so CLEVER! 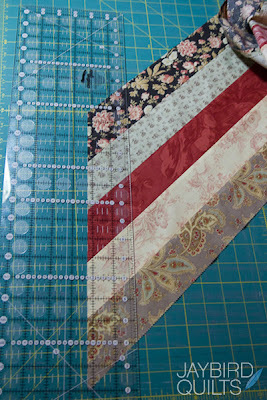 Love bias binding but have never thought about using strips. Thanks for that tip!! This is a wonderful and simple tutorial! I don't know why bias binding always seems intimidating. 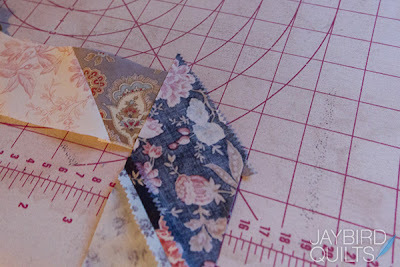 I also love that I can use scraps instead of yardage. I did this exact same technique on a quilt I made.But afterwards I had leftover fabric. 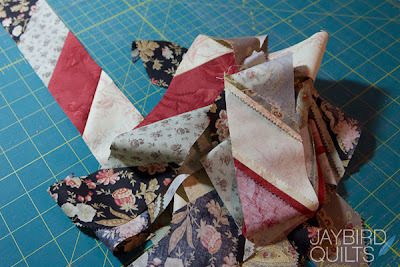 I just cut all my leftover fabric strip groups into 2" bias strips. Any ideas on creative ways to use up these leftover "patchy" bias strips. I'd love to incorporate them into their own quilt top, but I'm not sure the best way to put them together. Thanks for the tutorial! 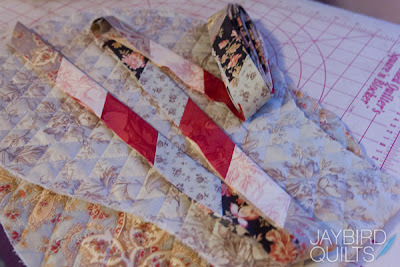 I made scrappy binding using your instructions for a quilt I was making in red, white and black fabric! It turned out very beautiful and I appreciate your sharing. It truly is a great way to use leftover fabrics. Waste not, want not! I know this is many years after you first posted it -- but I am sooooo delighted to have found it!! 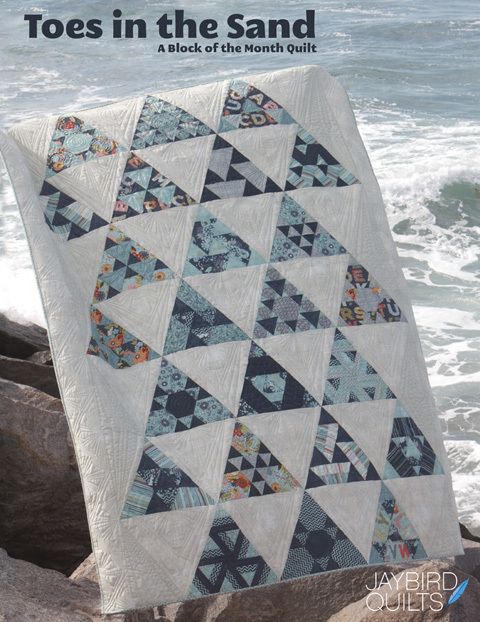 Loved your large Dresden Circle quilt first, then followed this link. How wonderfully and totally ingeneous! 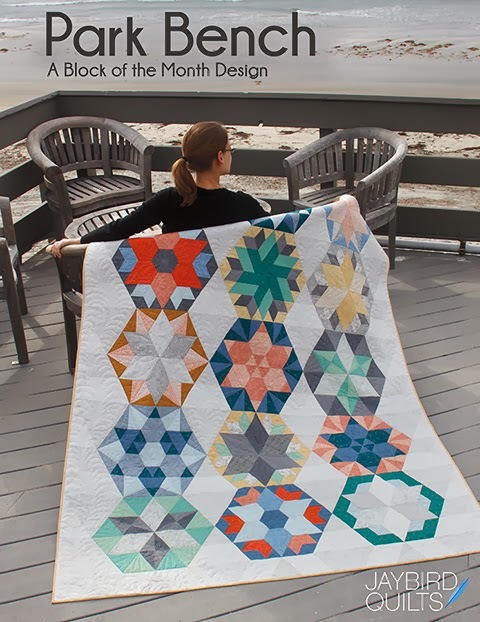 Makes total sense now that I see it, exactly how I make sets for repeated diamonds strips for big Lone Star diamond quilts too. So easy to remember. 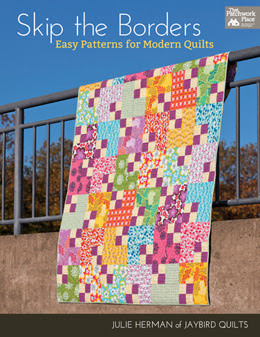 This'll be something I'll use repeatedly and as long as I quilt. And since I did such a big "how the heck didn't *I* already figure this out?" I'm sure I won't be forgetting it.